​A high-speed car chase in Houston, Texas, late on Wednesday morning ended with a police officer shooting the driver of the vehicle on live television. The Harris County Sheriff's Office confirmed that the suspect is dead. A high-speed car chase in Houston, Texas, late on Wednesday morning ended tragically with a police officer fatally shooting the driver of the vehicle on live television. 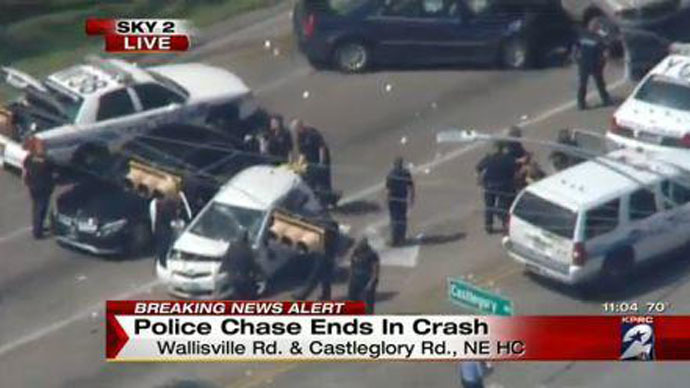 The driver of a blue Chrysler 300 had fled from law enforcement during an attempted traffic stop and spawned a multi-car pursuit in northeast Houston, KPRC News reported. The chase began at around 10:30 a.m. local time, according to the Houston Chronicle, and ended around half an hour later when the Chrysler collided into another car while a local news network helicopter captured the event on live TV. The incident occurred near a local middle school, prompting educators to momentarily lock down the building. When the driver got out he appeared to reach into the back of the vehicle, at which point police started shooting. An hour later, KPRC reported that the Harris County Sheriff's Office confirmed that the suspect has died. Later, the suspect's family identified him to local reporters as a 41-year-old father of three.